What will Stockholm residents and tourists be able to do at the future Nobel Center? How will school children move around the building, and what will visiting researchers encounter? Today the Nobel Center organisation is unveiling its latest plans about how the Center will be used. An intensive effort that has been under way for the past year to develop the inside of the building is now completed. The results are illustrated with the help of new images. “We have taken an in-depth look at how the building will be used and have taken advantage of every opportunity to create a comprehensive tour around the building for our visitors. We have added a number of new public exhibition areas that will be free of charge and that are aimed at strengthening the vertical connections between levels and activities. In this way, the building will achieve greater openness. 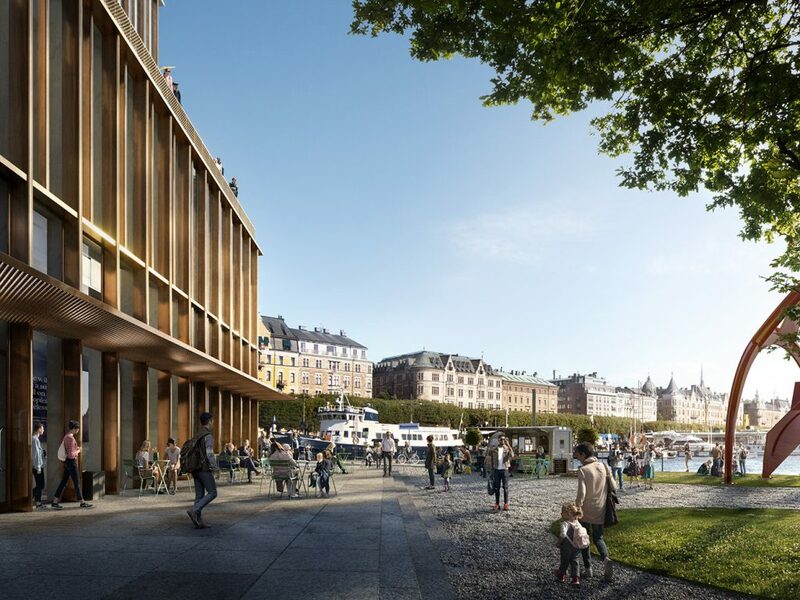 The Nobel Center will be a public building that interacts well with its surroundings, and it will make the entire Blasieholmen peninsula more accessible and inviting”, says Ylva Lageson, Chief Executive Officer of Nobelhuset, the company that will build and operate the Nobel Center. One source of guidance for this work has been the Nobel sphere’s many years of experience in organising public activities, including those at the Nobel Museum, and a variety of new activities that Stockholm residents have been invited to try. During 2017, for example, new activities included a Crash Course about the year’s scientific Nobel Prizes and Performance Lectures in collaboration with Stockholm’s Royal Dramatic Theatre. The Nobel Center organisation also produced a package of online teaching materials based on the 2017 Nobel Prizes, and for the first time an international Teacher Summit was organised − where Nobel Laureates met teachers from all over the world. “The Nobel Prize is a fantastic base for creating content and experiences. Visitors to the Nobel Center will feel welcome and will be able to move around from the exhibitions at the lowest levels all the way up to the restaurant and the open lounge areas on the very top level of the building. Perhaps they will be visiting the Center to learn more about gravitational waves but will also end up attending a seminar about Malala’s struggle for the right of girls to education. Or perhaps they will end a school visit about Alfred Nobel by venturing out onto the terrace of the building”, says Anna Sjöström Douagi, Programme Director of the Nobel Center. At least 600,000 annual visitors. 12 school classes per day. There will be dedicated classrooms and spaces for pupil experiments, as well as a packed-lunch room. 800 seats in the auditorium. 240 seated guests in the top-level restaurant. 180 café visitors in the bistro on the entrance level. During the summer months, there will be about 100 additional outdoors seats. 1 library and 1 museum shop. The building will be 31.5 metres (103 feet) tall, nearly 65 metres (213 feet) long and 38 metres (125 feet) wide. High resolution images can be found in our press archive. We have created an open entrance level that draws visitors into the building's activities and experiences. They will be able to see straight through the building, from the Hovslagargatan street side out towards the park and the new outdoor café. Exhibitions, an information counter, a café and a museum shop will be located here. The entrance hall is where visitors will begin to learn more about the courage, creativity and perseverance of the Nobel Laureates. Image: www.tmrw.se / © Nobelhuset AB. Architecture: David Chipperfield Architects. Several levels at the Nobel Center will house both temporary thematic exhibitions and permanent exhibitions about the Nobel Prize, the Laureates and Alfred Nobel. 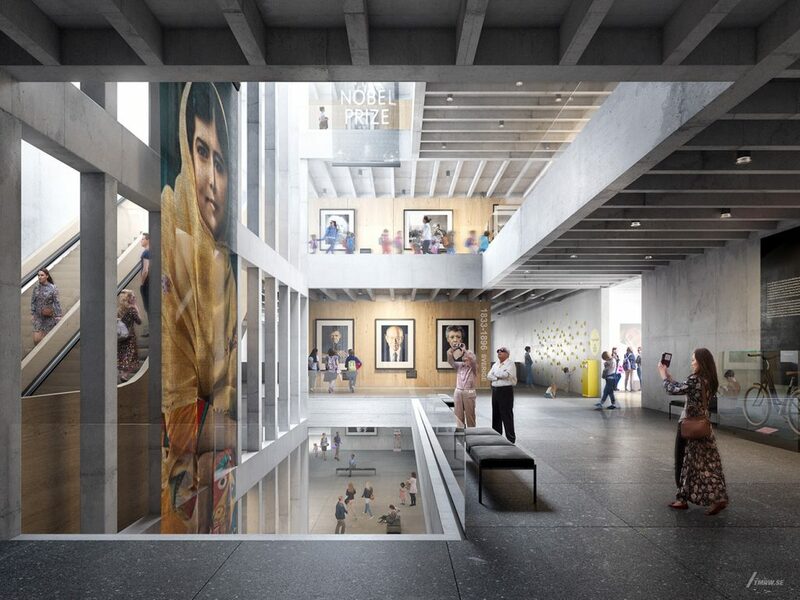 One innovation in the building will be its free "vertical exhibitions" that will provide a consistent theme along the opened-up stairwells, linking together the different levels and their activities. Here visitors from near and far will rub shoulders with Stockholm residents who are out for a stroll in their beautiful city. The exhibitions will also serve as the focus of programmes designed for school classes. The objective is for all children in Sweden to visit the Nobel Center at some time during their school years. Image: www.tmrw.se / © Nobelhuset AB. Architecture: David Chipperfield Architects. The auditorium has been designed to take full advantage of the fantastic views of Stockholm that the site offers: for example looking across Nybroviken, an inlet of the Baltic Sea, towards elegant Strandvägen boulevard. 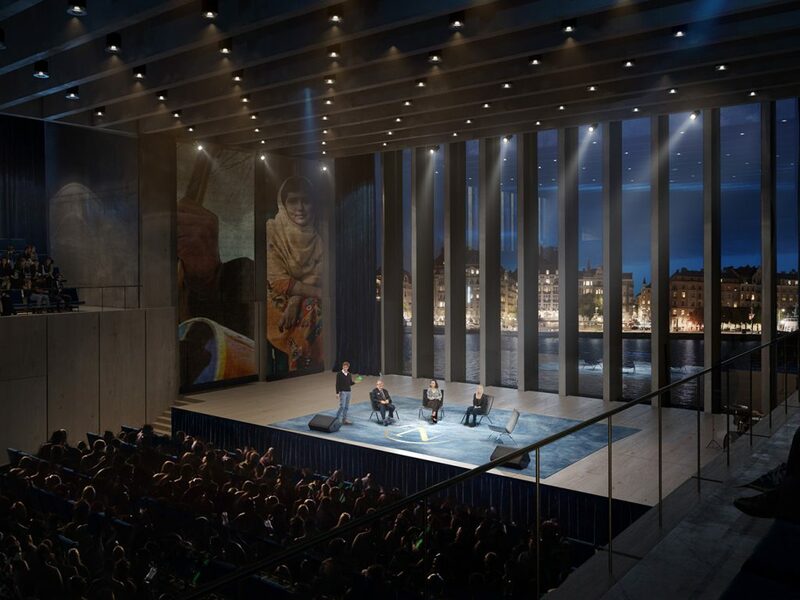 The auditorium will be linked together with the city, which will both be invited inside and serve as a backdrop to the stage – thereby tying the Nobel Prize together with Stockholm. It will serve as a year-round venue for performances and scientific seminars, open lectures and conversations with Nobel Laureates and other great thinkers. It will bring together researchers, students, business and political leaders and interested Stockholm residents. From the auditorium, it will be easy to continue to the public restaurant level, located at the very top of the building. Image: www.tmrw.se / © Nobelhuset AB. Architecture: David Chipperfield Architects. Next to the Nobel Center, a new public park will be created south-east of the building. During the summer months, it will be possible to open up the façade and let the Nobel Center café move partly outdoors. Here the adjacent National Museum and the Nobel Center will meet. Visitors to Stockholm from faraway places will be able to spend a day combining a look at Swedish art and design with an opportunity to learn more about the Nobel Prize. Boats will dock along the quay, and the whole peninsula will become safer and more accessible to Stockholm residents. The façade of the Nobel Center will be decorated with glass, natural stone and brass-coloured vertical stainless steel fins. Image: www.tmrw.se / © Nobelhuset AB. Architecture: David Chipperfield Architects. The Nobel Center will be a new building in the heart of Stockholm where the Nobel Prize and the fantastic discoveries and contributions for which the Laureates have been rewarded will find their natural venue. The Nobel Prize will provide the basis for broad-based public activities including exhibitions, school programmes, lectures and discussions about the major issues of our era. 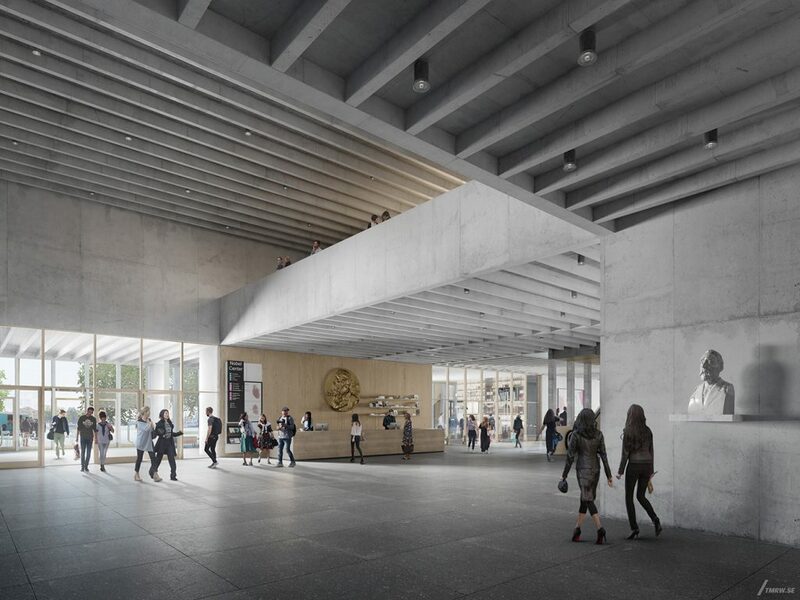 The Nobel Center will be a place where committed reformers, curious Stockholm residents, school classes and visiting tourists can meet and be inspired to contribute to a better world. The elegant, timeless building was designed by David Chipperfield Architects Berlin.